There are many routes available to you for Continuing with your Personal and professional Development (CPD) after you have attended your NLP training. 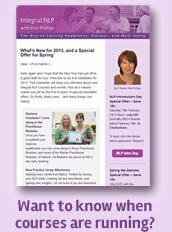 One of the most popular is the NLP Practice Mornings or Evenings and my article on Why Attend an NLP Practice Class? details the benefits. There are so many benefits. If you are already a Practitioner, this gives you the opportunity to develop and perfect your skills, plus you can use this growth towards your Continuing Professional Development with ANLP. If you are a Diploma graduate, you can note your confidence increasing as you practise and receive feedback from your colleagues - particularly useful if you’ve recently qualified. And if you are simply wishing to learn more about NLP, you can watch the demonstrations, listen to the discussion groups and perhaps even volunteer to take part as a client. Please click on the title link above for further information. Many people mention how repeating the courses is one of the best things that they have ever done. This provides a great opportunity to revisit the training, see things from a different perspective and to hone and perfect your skills. You can repeat any course for just £25 a day. However, repeat places are limited and very popular so please book your place early. Please use the title link above for further information. Plus you may wish to use your skills to earn a living as an NLP Practitioner. Or you may wish to progress further through the NLP Master Practitioner Programme which paths the way towards future development as an NLP Psychotherapist, an NLP Coach and/or an NLP Trainer. The links in the title above will take you through to the various website pages giving you further information on each role.